Mysterious and alluring, lockets evoke tender emotions and have been a favorite accessory for centuries. 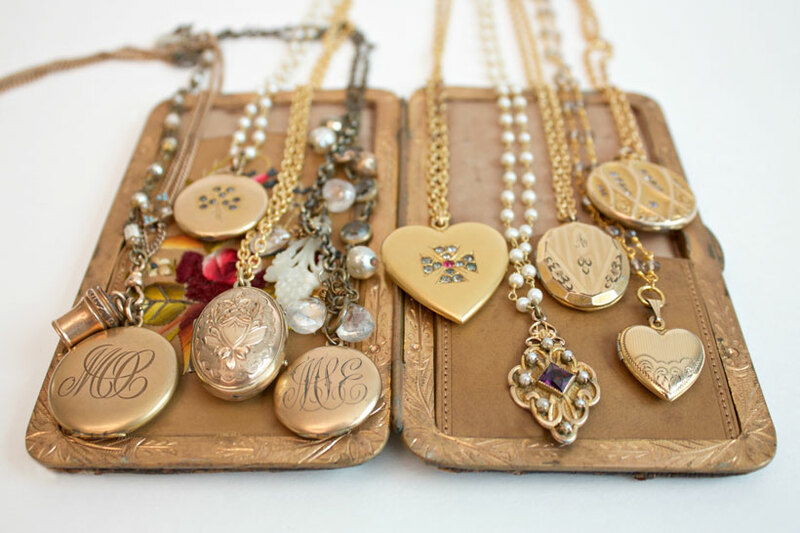 Lockets became a “must have” fashion accessory during the Victoria era. There is nothing more romantic than wearing a precious reminder of someone you love close to your heart. For centuries, the locket, a pendant with a secret, has captured our most meaningful personal stories. Opening up to reveal a small space to insert a portrait, a lock of hair or tiny love letter, lockets are both classic and modern. Set with a semi-precious stone, this round locket is bright and cheerful, with a floral design on the front. 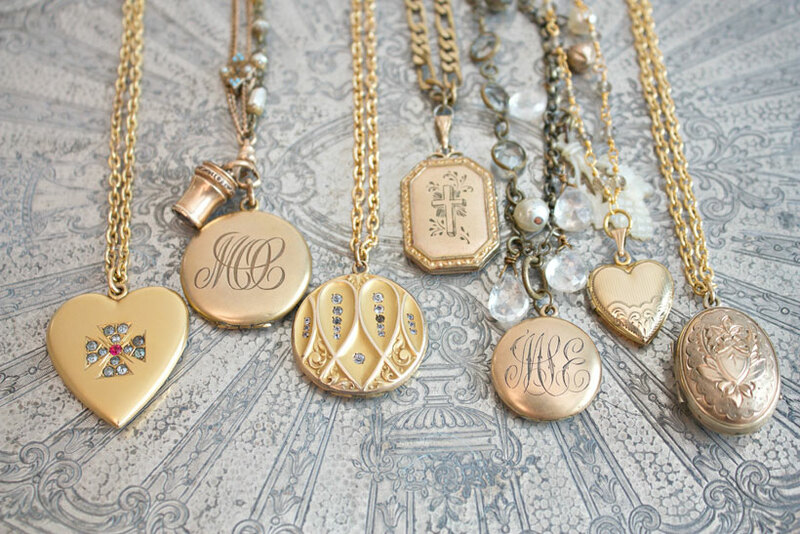 Lockets have a long history, with each generation embracing the charm of these sentimental pieces of jewelry. Lockets evolved from ancient amulets. European designs for lockets first seem to appear in the 16th century, when small pendants were worn to conceal good luck charms, painted portraits, small fabric squares soaked in perfume that warded off the smells on public thoroughfares and even, on occasion, poison. Life was much more fragile then than it is now. Memento mori (Latin for “remember death”) jewelry was popular; a locket would honor a deceased loved one and keep that memory close. An antique locket on a chain of Black hills gold. Queen Elizabeth I of England wore her locket ring daily. It contained a painted portrait of her mother, Anne Boleyn, and herself. She often gifted those in her inner circle with a jeweled locket containing her portrait. The Elizabethans were enamored of lockets; the artists who painted the miniature portraits contained within them were the best artists of their time. The portraits for the lockets, as well as the lockets themselves, were only for the very wealthy as they were costly. 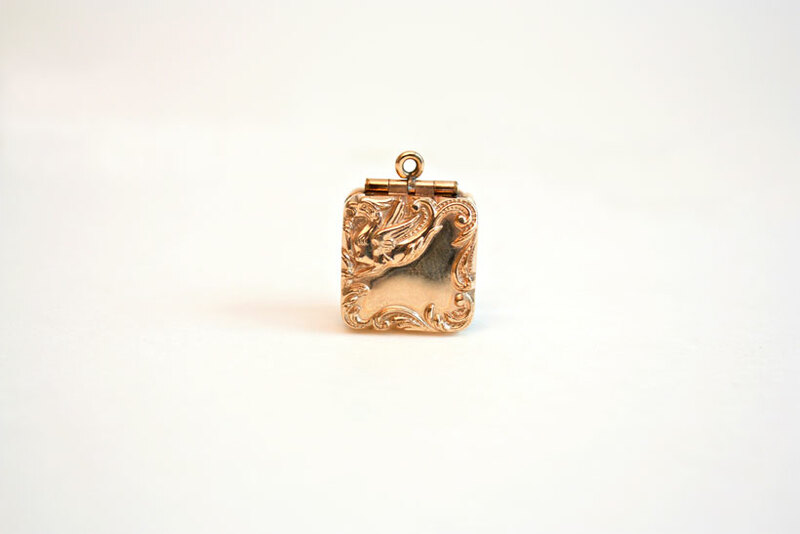 Rare to find, this square double-sided gold locket features a raised relief design of rococo scrolls and a mythical griffin. 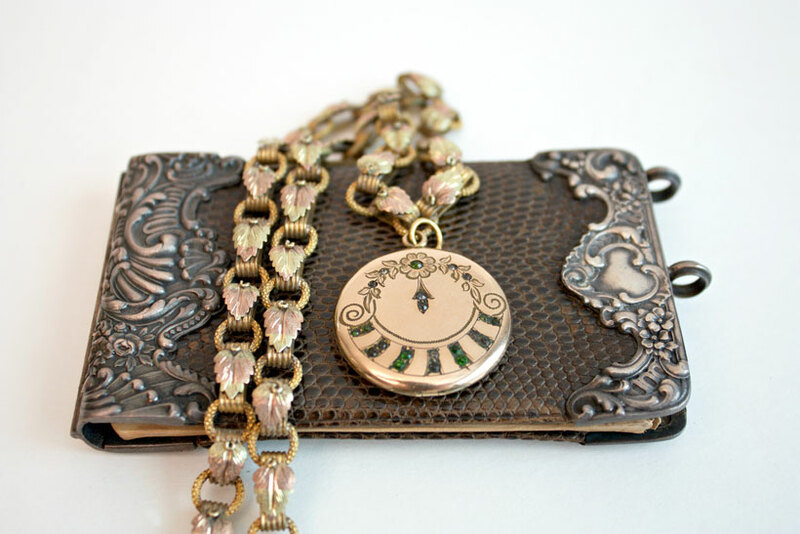 Lockets became a “must have” fashion accessory during the Victorian era. Prince Albert gifted his beloved Victoria with a bracelet that had eight lockets, filled with a lock of hair from each of their eight children. Victorian ladies wore lockets on chains or velvet ribbons. Once Albert died, Queen Victoria wore a mourning locket with a photo of him inside until her own death. In the early 1900s lockets were mass-produced in brass, steel and copper, bringing them within the budgets of the middle class. By the mid 1940s, costume jewelry lockets were all the rage. Known as “sweetheart” jewelry, sentimental lockets were even sold in post offices for WWII soldiers to send to their girlfriends, fiancées and wives. 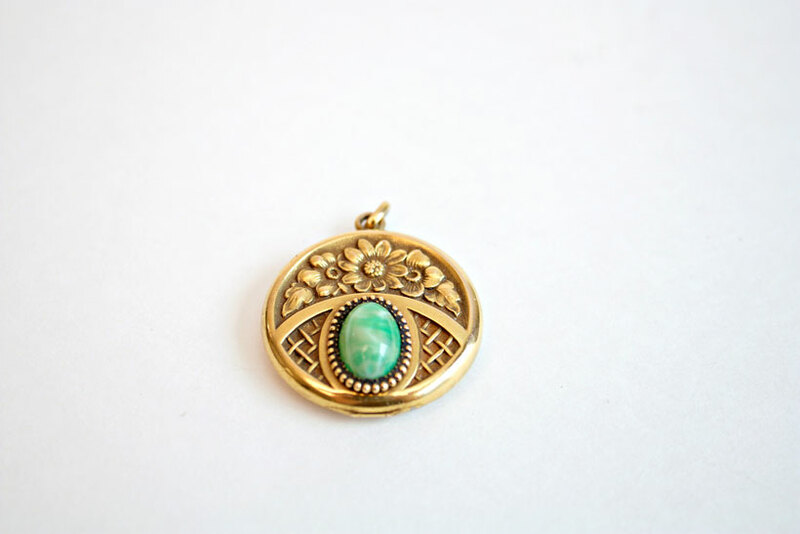 Antique lockets are available in a variety of shapes, sizes and price point. You’re sure to find a piece that suits your style and your budget. Highly collectable, lockets have universal appeal. Expect to pay a few hundred dollars for gold filled or sterling lockets; real gold and diamond lockets will command thousands. Antique lockets in oval and round shapes are more common; hearts and book form lockets are rarer and therefore more collectable. Buy quality. Lockets come in a variety of quality and price points: gold with diamonds and other precious stones, gold filled, sterling silver, brass and gold- and silver-toned costume lockets. Buy lockets in good condition. Check the hinges, the finish and the interior compartments. Try to avoid lockets with deep scratches or other damage. Buy lockets with their original parts, including their photo covers, if possible. Some lockets were made with glass covers, some with celluloid covers, and some were made and sold without any covering for the photo spaces at all. Buy lockets that capture your heart. Buy only pieces you love, and you will have a sentimental addition to your jewelry collection, with a history and exceptional Old World workmanship. Whether you are a collector or appreciate their timeless yet modern appeal, lockets are a personal way to display your fashion style. In a world where everything seems public, lockets are a personal sanctuary to keep your most valuable photos and mementoes private.